This Canary Island Date Palm certainly looked impressive (as these types of trees typically do) but it was simply too big and needed to be removed. It’s the biggest tree of its kind that our MD Craig Bauer has ever climbed and took 3 hours and 30 minutes in total to remove. We have a large crane truck that would have been ideal for this particular job but the tree was located in a back yard with limited access, so it had to be done the old fashioned way! all while standing on 2 small “spikes” which are driven into the crown. The trunk was then blocked down in 500mm long sections and our 3 tonne wheeled loader was used to removed the material from the site, which made the job far more efficient and therefore economical for our customer. 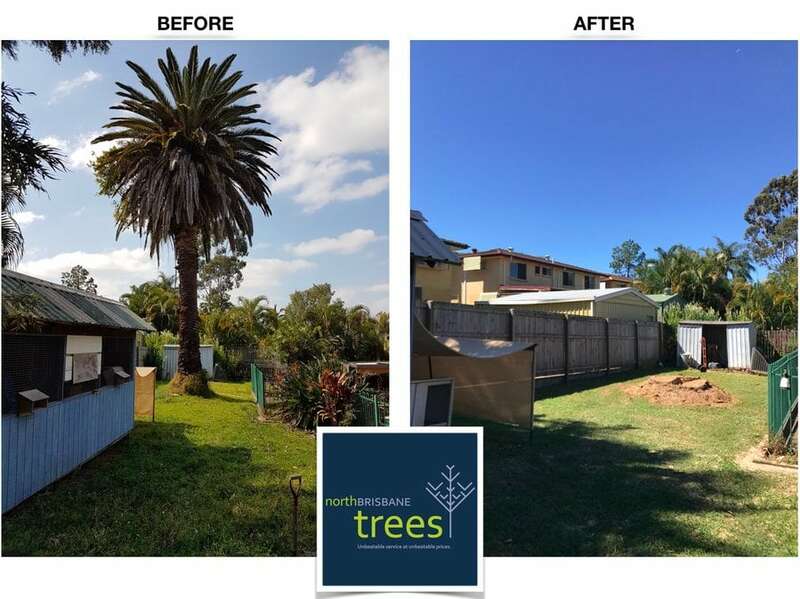 North Brisbane Trees did the best job possible and was chosen over other less experienced and less affordable options. We were chosen because we offered to do the job in a lot less time and for a lot less money than the rest. Some companies were quoting thousands of $$$ and even going as far as saying this would take one full day to remove! Suffice to say, we got the palm tree removed in a handful of hours at a very affordable price for our customer. And you’ll also see, we cleaned up after ourselves. No project too big or too small and we always leave a job site clean. Public liability insurance (and how much). This is invaluable. Are they a team of professionals or just a 1/2 person outfit? Do they have the correct equipment for the job? Do they have qualified members on the team? Qualifications show a thorough, deeper understanding of trees that goes beyond using a saw! Have they been doing this a long time? Experience matters. Fly by night jokers are a big risk to the tree, your property and even human life. At North Brisbane Trees, you know we have comprehensive public liability insurance, we are more than just a one man show, we’ve got all the right tools and machinery for any size job, we’ve got a qualified Arborist on board and we’ve been doing this for over a decade. This is the North Brisbane Trees difference. Call on 07 3289 3610 for your free quote or fill out the form on our Contact page.